Whisk together the egg, flour, milk, nutmeg, salt and pepper. Pour into a blender and add kale, blend until smooth. Ladle the mixture to cover the bottom of a greased small non-stick pan and fry for 30seconds aside or until lightly golden. Prepare the dressing for your crepes, combine a squeeze of lemon juice, goats cheese, garlic, plain yoghurt and chives. Season to taste. Using a vegetable peeler run the blade down baby cucumbers to make ribbons, do the same with raw beetroot for delicious crunch. 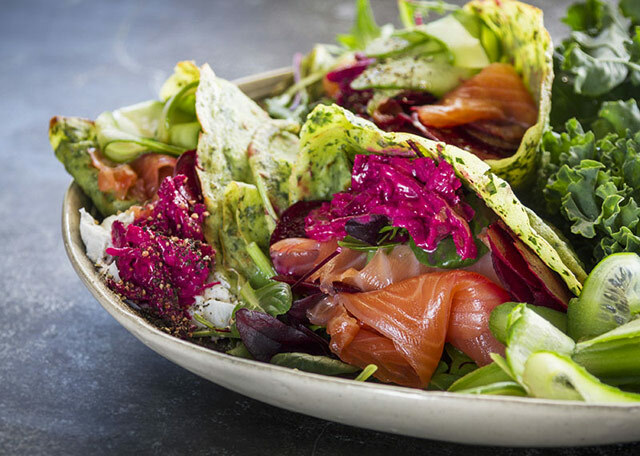 Stuff your spinach crepes with smoked trout, super thin sliced beetroots, shaved cucumbers, baby leaves and goats cheese and chive dressing. These crepes are also delicious with a dollop of hummus, Greek salad and some grated apple with smoked chicken breasts.